The quick-to-the-snap spy photographers at KGP caught this facelifted 2009 Honda Civic Hybrid sedan out sunning itself in the California desert. This newly nipped and tucked 'lectrified Civic looks like it's getting a new front bumper with a three-intake design rather than the current single-holed intake. And check out that grille opening surrounding the big Honda "H." Yup, it certainly looks more angular to us. Check out the rest of the subtle changes below the jump in the full spy report. 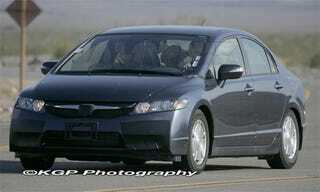 We caught Honda testing a prototype for a facelifted Civic Hybrid in the California desert. The revamped Civic gets a new front bumper, with a three-intake design in place of the current model's single central intake. A redesigned, more angular grille-opening surrounds the Civic's familiar chrome bar containing the Honda "H." It also appears that the headlights' internals have been ever so slightly restyled. Although the changes to the Civic Hybrid's nose are quite subtle, the overall effect is significantly more sporty than today's model, which looks a bit soft by comparison. This Civic's rear will also see some very minor changes to the tail-lights, and a new trim piece protrudes between the rear lamps. The rest of the Hybrid's rear-end appears unchanged.